CLIFTON PARK, N.Y., Feb. 16 (SEND2PRESS NEWSWIRE) — Craig Thomas announced the launch of Thomas Pest Services. Thomas Pest Services provides pest management services and canine bed bug scent detection to residential and commercial facilities in the Capital District Region. Thomas Pest Services is a third generation pest management firm who is committed to providing quality service, integrated pest management and education to their customers. “Our team is excited to share our enthusiasm and knowledge with the upstate New York Region,” said Craig Thomas, President. Thomas Pest Services specializes in bed bug remediation and canine scent bed bug detection with their fox red retriever named Promise. Promise was raised by Green Collar K9 dogs that can be found working with the CIA, FBI and police departments. Promise received additional training from Action Canine Institute in Michigan with her handler. This type of training provides the very best candidates of all dogs trained in scent detection for the pest control industry. Why bring “Promise” to fight bed bugs? * K-9’s will find bedbugs in areas that humans cannot inspect. * K-9’s can perform an inspection 80% faster than a human, saving high labor costs. * K-9’s are 98% effective at finding all stages of bedbugs including eggs. * K-9’s can detect bedbugs inside furniture/walls/objects where humans cannot. * K-9’s reduce the number of units treated and pesticides by pin-pointing locations. Promise and her handler work several times a day together to detect the presence of viable bed bugs through the odor that is emitted from the live insects or eggs. Promise is a loveable dog who enjoys playing ball and going into new environments looking for bed bugs. 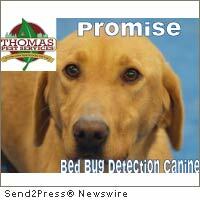 According to Thomas, “Canine scent detection provides our customers cutting edge technology for identifying existing bed bugs infestations, but also a great preventative tool.” Research shows, as public awareness of bed bugs grows, many Americans are modifying their behavior to minimize infestations. Thomas Pest Services is excited to serve the local community, providing pest solutions ranging from carpenter ants, bed bugs, mice, spiders and termites. “We are proud to offer the latest technologies to our customers, especially in the escalating fight against bed bugs,” said Thomas. For more information regarding bed bugs, or to receive a free educational session for your organization, contact Sarah Thomas at 877.518.BUGS or sthomas@518gotpests.com . The Thomas family has experience since 1949 provided pest management services to commercial, industrial, and residential clients for over three generations. Thomas Pest Services (www.518gotpests.com) serves the entire Hudson Valley and now serves the Capital District Region – Albany, Fulton, Rensselear, Saratoga, Schenectady, Warren and Washington Counties. News issued by: Thomas Pest Services, Inc. Original Keywords: canine pest control services, K-9, bed bugs, Thomas Pest Services Inc, new york, pest management services to commercial, industrial, and residential clients, Green Collar K9 dogs, Craig Thomas Thomas Pest Services, Inc. Clifton Park New York CLIFTON PARK, N.Y.
News Source: Thomas Pest Services, Inc.
More from Thomas Pest Services, Inc.
REFERENCES: Facilities and Building Maintenance News, canine pest control services, K-9, bed bugs, Thomas Pest Services Inc, new york, pest management services to commercial, industrial, and residential clients, Green Collar K9 dogs, Craig Thomas Thomas Pest Services, Inc. Clifton Park New York CLIFTON PARK, N.Y.